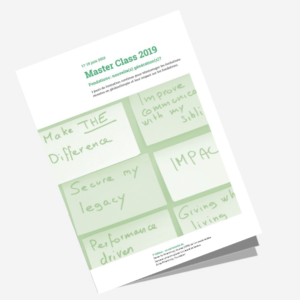 In 2019, after 6 editions and more than 150 participants in Romandie, Swiss Philanthropy Foundation continues to organise the Master Class , in partnership with the Center for Philanthropy Studies of Basel University (CEPS) and the Geneva Centre for Philanthropy of the University of Geneva (UNIGE). The goal of this cross-training is the acquisition of tools and practical knowledge that allow to choose the right philanthropic vehicle, to create and manage a foundation, while meeting the requirements of tomorrow. It will enable an understanding of current philanthropic issues and the overall theoretical framework of a foundation, as well as its implementation, through case studies and testimonials on key governance issues of the Foundation Board, on management and distribution of the foundation heritage. The legal, governance, asset management and strategy bases, as well as the impact of the supported projects will be covered. This training is intended primarily for professionals interacting with foundations in the financial, banking, and legal fields (bankers, notaries and lawyers), managers of foundations (Board members and directors) or individuals, philanthropists, wishing to create a foundation. The 2019 edition will take place over 3 days from 17 June to 19 June 2019 at the Château de Bossey (VD). If you are interested in 2019, please fill out the registration form here. As the number of places is limited to 25, participants will be selected based on a file. A few places are still available and the registration deadline has been extended to Friday 10 May 2019.